Deadline.com broke word over the weekend that 20th Century Fox has won the five studio bidding war for the movie version of Seth Grahame-Smith’s hit book, Abraham Lincoln: Vampire Hunter. Grahame-Smith wrote the screenplay for the movie, while Timur Bekmambetov (Wanted) is set to direct with Tim Burton as one of the producers. Production on the 3D movie is set to start in March, 2011, with no word yet on a target release date. Fox apparently wanted Abraham Lincoln: Vampire Hunter badly and went the extra mile to woo Burton and Bekmambetov, who optioned the film with their own money earlier this year. When they arrived on the Fox lot, they found it had been decorated with bloody footprints, axes, and even a bugle player in a Confederate uniform. Vampire Hunter is a biographical/vampire mashup that tells the story of America’s sixteenth president and his desire to kill all blood suckers. We gave a glowing review (4.5 out of 5 stars) to Vampire Hunter when it first came out earlier this year, and hope its just as good on the big screen. While the writing will likely be very good, a lot will hinge on who they get to play Honest Abe. My vote is for the guy who plays him in the book trailer, see it below. I’m also curious to see how gory the movie will be because the book itself wasn’t too heavy on gore except for one or two moments. I expect the reaction to be positive from the younger crowd that loves vampires of all shapes and types, but this movie might have some crossover appeal to older audiences too. 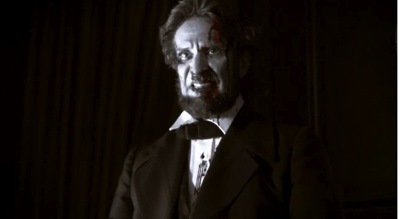 What do you think about Abraham Lincoln: Vampire Hunter being made into a movie? Think it will lead to more monster/literary mashups to be turned into movies?